There’s a new war now. A war of words. A war for information. A war for truth. Politicians skew reality to emerge in more favourable lights, mainstream news media are conflicted by their growing conglomerate backing, and ordinary people are left struggling to see a clear picture of events. When it’s time to be counted, where will you stand? As citizens of the world, we each have a role to play. We have a responsibility to determine where we stand, politically, and ideologically. But in these turbulent times of “alternative facts”, “fake news”, and the politicization of truth, who will stand witness to the events that surround us? Be counted in this battle against vested interests, increasing governmental censorship, and global suppression of activists, and stand with Global Research. Help support our work based on the fundamental respect for critical dialogue and accuracy in reporting. Global Research strives for peace, and we have but one mandate: to share timely, independent and vital information to readers across the globe. We act as a global platform to let the voices of dissent, protest, and expert witnesses and academics be heard and disseminated internationally. We need to stand together to continuously question politics, false statements, and the suppression of independent thought. 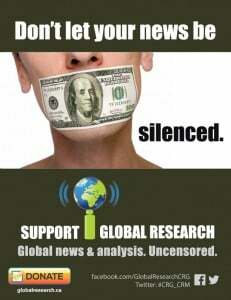 Unlike mainstream media, Global Research doesn’t accept money from corporations or private foundations, which now more than ever before are seeking to control and manipulate what you see and hear. 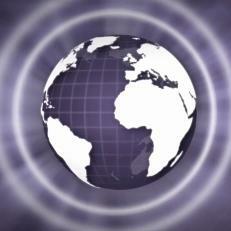 Global Research is 100% self-funded, and has been since its inception. We rely principally on donations from people like you. We value every cent and every dollar that our valued readers donate, because it allows us to continue to offer vital independent reporting of issues with truth and insight. Your voice matters – support those who aren’t given one. Don’t let the source of your information be tainted. This year, every year, be counted among those who will fight for independent voices to be heard. Please donate. Every dollar counts. We’re grateful for your support.